A Victor Moses brace and one from Captain John Mikel Obi ensured a 3-1 win for Nigeria over Algeria set Nigeria on course and in a Russia 2018 Qualifying match on Saturday. With that win Nigeria also go four points clear in the group that also has Cameroon and Zambia. It was Victor Moses that opened scores in the 24th minute through an individual effort and some luck too. And with five minutes left to play in the first half, Mikel Obi received a pass from Alex Iwobi and with the Algerian defenders thinking it was offside, Mikel had the easiest of tap ins to put Nigeria 2-0 up at half time. The Super Eagles were the more attack minded side in the half with Victor Moses having one of the earliest attempts at goal in the 6th minute of the encounter as he intercepted a ball and made his way down to the eighteen yard box, shook off his marker but shot narrowly wide. The next ten minutes had even exchanges from both side but with the Super Eagles having two corner kicks in that period. But the Algerians got their first shot on target in the 15th minute when Taiger shot from distance but a grateful Daniel Akpeyi in goal for Nigeria clutched the ball. Three minutes later, Mikel Obi lost the ball in the midfield and an Algerian attack led to a cross into the box that was punched clear by Akpeyi. 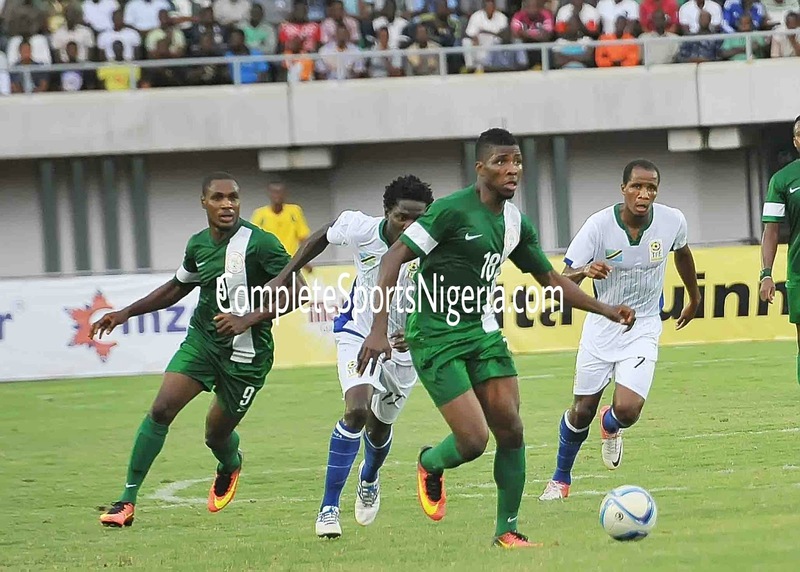 It was end to end as the Eagles attacked again a minute later but Mikel Obi shot wide. The quiet Algerians seemed to have woken up from their slumber as Brahimi who had suddenly become a thorn in the Super Eagles’ flesh found space on the left and crossed into the box before Akpeyi punched clear. Gernot Rohr threw Oghenekaro Etebo into his starting eleven even though he had never featured or be called up before under the German and he did not disappoint. Etebo covered almost every blade of grass on the pitch and was the hardest worker of the lot. Between Oghenekaro Etebo, Mikel Obi and Ogenyi Onazi, the Eagles’ midfield was lit. The control was sublime and the passes had near one hundred percent accuracy. In one of such moments in the 29th minute, Etebo won the ball in midfield, moved a step forward and released the ball to Mikel who freed Victor Moses on the far left, but Moses’ cross into the box could not be connected by Iheanachor who went up with his head. But the Algerians were not done yet with their forays. Bentaleeb freed Brahimi on the left who crossed the ball into the box for Bentaleb but Omeruo and Leon Balogun clattered into each other before sanity was retored. Two minutes later in the 35th Brahimi made a rush down the left and crossed into the box for Bentaleeb who controlled well but shot wide in the six yard box. The Algerians attacked again from the left but Taiger blasts wide in the box. And just before half time, between Bentaleeb and Taiger, Algeria almost pulled one back as Ekong’s header went wrong but the ball was deflected for a corner. In the second half, Bentaleeb pulled one back, a stunner from distance after MAhrez went on a mazy run before releasing the ball for his team mate. With fifteen minutes left on the clock, the Algerians continued to pile the pressure, this time it was Bentaleeb and Brahimi connecting in the box bot Brahimi’s shot wide. Victor Moses, however, killed off whatever plans the Algerians had to get a result when he took time to pick his spot as a loose ball fell to him in the six yard box. At 3-1, it was over for the Algerians and the Super Eagles can now dream again.